Born in North Battleford, Saskatchewan on September 13, 1926, Emile Percy Francis enjoyed a terrific playing career before embarking on a path that led him to building three NHL teams, and being named a Builder in the Hockey Hall of Fame. Emile's passion for hockey was born early in his hometown. "North Battleford at that point in time was a town of 12,000 people," began Francis. "My Dad died when I was 8 years old and my uncle took me everywhere. He was a defenceman on a senior team there called the North Battleford Beavers, and they played against cities like Saskatoon, Prince Albert and FlinFlon." Emile clearly recalls seeing his first competitive hockey game. "I wanted to see a hockey game. The very first game I ever went to was in North Battleford and they had natural ice in those days. The Beavers would start the season on Boxing Day. I was selling newspapers, the Saskatoon Star-Phoenix, trying to make a nickel here and there. It was the Depression, and there weren't too many nickels around, believe me! I would get half a cent for every paper that I sold. By then, my uncle had left to play hockey in Sudbury. For an adult, it was 75 cents and for a kid, 25 cents. I didn't have 25 cents so I checked out the hotel where the FlinFlon Bombers stayed, which was a block away from the rink. They would dress in the hotel, put their coats over their uniforms and carry their skates and stick to go down to the arena. I waited for the biggest guy to come out and I'll never forget – his name was Butch Stahan. I said, 'Mr. Stahan. I don't have a quarter. Would you put me under your coat to get me to your game?' He said, 'Come on, kid,' and bingo! I got through that door and they went to the dressing room on the left and I took off to the right. There was no way the guard was going to catch me. That was the very first time I ever had a chance to watch hockey and I was mesmerized. I loved the game." Watching live hockey fuelled Emile's passion, but so did visualizing the NHL players described by Foster Hewitt on 'Hockey Night in Canada.' "I was home every Saturday night with my radio on. Foster Hewitt would say, 'Hello Canada and hockey fans in the United States ... ' There were only six teams in the league (at that time) and I was a real Toronto Maple Leafs fan. When I was 12 years old, I woke up in the middle of the night and had been dreaming that I was playing goal for the Chicago Black Hawks. I was in shock. I said to myself, 'I can't play for the Chicago Black Hawks! I'm going to play for the Toronto Maple Leafs!' Well, guess who I broke into the NHL with? The Chicago Black Hawks! It was a dream come true, believe me!" While hockey captured Emile's imagination, it took his uncle to help confirm which position he should play. "He coached me from the time I started playing. I was a centre most of the time, the best player on the team, so I played different positions. When my uncle came back from overseas (in World War II), he said, 'You have to decide what you want to be. You're playing forward one day and goalie the next.' I said, 'I think I want to be a goalkeeper.' He said, 'Why would you want to be a goalkeeper?' I said, 'Because a goalkeeper plays 60 minutes a game. I like that challenge.' He said, 'Okay! From now on, you're going to be a goalkeeper.' I played goal from then on." What contributed to Francis's dexterity in goal was his skill in baseball. "I was a shortstop in baseball and was very quick and had good hands." The young goaltender joined the team he had watched practise on so many occasions, tending goal in a handful of games for the North Battleford Beavers of the Saskatchewan Junior Hockey League in 1941-42 and 1942-43. Just 17 in 1943-44, Francis moved away from home and played for the Philadelphia Falcons of the Eastern Amateur Hockey League (EAHL). The next year, he joined the EAHL's Washington Lions. Returning to Saskatchewan, Francis shone in goal for the Moose Jaw Canucks of the Saskatchewan Junior Hockey League, leading them to 18 regular season games without a loss in 1945-46. It was here that Emile picked up the nickname he carried throughout his career. "When I was playing with the Moose Jaw Canucks, we were playing in Regina and the Regina Leader-Post had a sports editor named Scotty Melville. The next day, he wrote, 'Moose Jaw Canucks unveiled a new goalkeeper named Emile Francis and he's quick as a cat.' That nickname, 'Cat,' stuck for the rest of my hockey career." By joining the Canucks, Francis became property of the Chicago Black Hawks. "The Moose Jaw Canucks were a sponsored club of the Chicago Black Hawks. Since they were a sponsored club, Chicago owned your rights if you were to go professional. That year, we had a great club – Metro Prystai, Bert Olmstead." Emile was invited to the Black Hawks' training camp in Regina in the fall of 1946, which put him one step closer to achieving a childhood dream. But sometimes, things aren't what they appear. "(Businessman) Bill Hunter bought into the Regina Caps of the old Western League. He came to see me in June and offered me $5,000 to play for his team. Bill Tobin (of the Black Hawks) decided he was going to offer me a contract. He said, 'We'll give you $5,000 to play in Chicago and $3,000 to play for our minor league team in Kansas City.' I said, '$3,000! I can make that much money playing in the Western League in Regina.' He said, 'I don't think you're telling me the truth,' so I said, 'Thank you for asking me to your training camp. I'll see you later.' I went back to my room and called Bill Hunter. They were starting their training camp the next day. I said, 'Is that offer of $5,000 to play for Regina still on the table?' He said, 'Not only that, but I'll give you $1,000 to sign.' I said, 'I'll be over there in 30 minutes!'" In spite of featuring future Hall of Famers such as Max and Doug Bentley, Bill Mosienko, Bill Gadsby and Clint Smith, Chicago was dismal that season, and in January 1947, was mired in last place. "Tiny Thompson, once a great goaltender and by that time, a scout for the Black Hawks, kept coming to me and telling me I had to sign with Chicago," explained Francis. 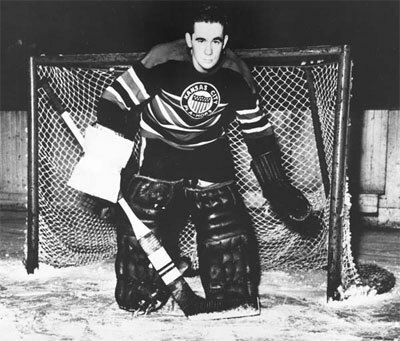 Over the course of his seven-season career, netminder Paul Bibeault had bounced from Montreal to Toronto, then Boston, returned to Montreal and was in his final NHL season, playing with Chicago in 1946-47. But the team was in an extended slump and needed to make some personnel changes, and planned on replacing Bibeault with Francis. "I said, 'They'd better change their offer or I'm stating right where I am.' We finally came to an agreement. I said, 'I'll go to Chicago, but what're you going to do to help Regina? I'm not leaving until you look after them.' Chicago gave them $25,000, and they needed it at the time." Emile joined the Hawks for the remainder of their woeful season. Chicago was coached by Charlie Conacher, the former Maple Leafs' star who had been one of Francis's favourites while listening to Foster Hewitt on 'Hockey Night in Canada.' "I had Charlie Conacher's picture on my wall when I was a kid. He was a hero of mine. His brother Roy was playing with us and Roy's twin (Bert, who lost an eye in a ball hockey game) was with the team as an assistant trainer." While tending goal for Chicago, one of Emile's innovations caused quite a controversy. Already accomplished, Emile harkened back to his baseball days and innovated with his equipment. "The old goal gloves were five-fingered gloves with a little wee webbing between your forefinger and your thumb. It wasn't two inches wide, so as a result, every time you caught a puck, it caught you right in the middle of your hand. I can still feel bruises today! Because of baseball, I got a first baseman's mitt. It was a George McQuinn model made by Rawlings. He played for the New York Yankees. At training camp, I asked the trainer to take the glove to a shoemaker and have him take the cuff off an old hockey glove and sew it onto the baseball glove. I used that glove." Although the innovative creation barely caused a ripple in the minors, the NHL was a different story. "We were playing in Detroit and Jack Adams was the coach and manager. At quarter to 8:00, we would warm up and then the game would start at 8:00. The officials came out and Jack Adams was yelling from the bench to King Clancy, who was refereeing. King went over to the bench and Adams was pointing towards me. I thought maybe there was no goal judge, but all of a sudden, King came over to me and said, 'Let me see that glove you've got there.' I showed him the glove. He said, 'You can't use that.' I said, 'What do you mean, I can't use it?' He said, 'It's too big!' I explained that I simply took a first baseman's glove and had a cuff sewn onto it. He said, 'You can't use it.' But at the time, you only had one goalkeeper on a team, so I said, 'If I can't use this glove, you've got no game tonight!' 'I said, 'I don't have any other glove and I have no intention of using any other glove. I'm not using a forward's glove to play goal.'" The next day, the Hawks were travelling to Montreal, the home of both the Canadiens and the NHL's head office at the time. Clancy insisted on a meeting between Emile and NHL President Clarence Campbell. "Mr. Campbell questioned me for an hour – 'Why did you do this? How much did you pay for it? Who sewed that cuff on?' I said, 'I had the glove made to protect my hand. Those other goal gloves aren't worth a nickel. I'm surprised goalkeepers don't break their hands using those.' He listened and finally said, 'Okay, you can use it.' Well, the story got out and within a month, all the sporting goods companies were making those goal gloves. I should have copyrighted the idea! All I wanted was be a better goalkeeper. From then on, every goalkeeper started using the catching glove." Chicago finished last in 1946-47 and in 1947-48. Clearly, the team needed to make changes. They traded Max Bentley and Cy Thomas to Toronto and got five excellent players in return. On October 7, 1948, the Hawks traded Francis and Alex Kaleta to the New York Rangers for Jim Henry, another goaltender. "The Rangers had Charlie Rayner, who was 29 at the time, and teams only carried one goalkeeper. I was 21. They sent me to their American Hockey League farm club, the New Haven Ramblers. Lynn Patrick was the manager and coach. The next year, the Rangers got off to a lousy start. They fired (coach) Neil Colville and brought in Lynn Patrick. Just before they were going to Chicago, Rayner got hurt in practice so they called me up and I went to Chicago and we won 3-0. That was Lynn Patrick's first win and justice for me. Bill Tobin was standing over in the corner and I gave him the finger. That cost me $500. When you're making $6,000, that was a lot of money. I have never given anyone the finger since!" 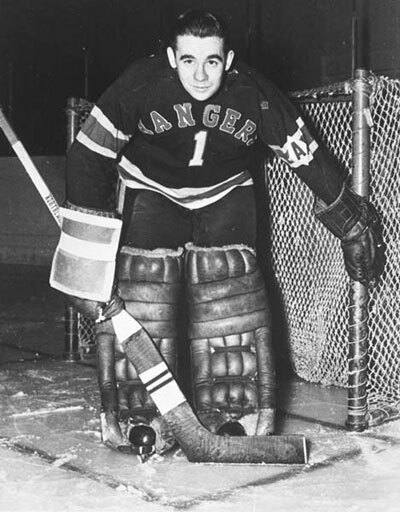 Over the course of four seasons, 'the Cat' played a handful of games replacing Rayner in the Rangers' goal, spending the rest of that time in the AHL. 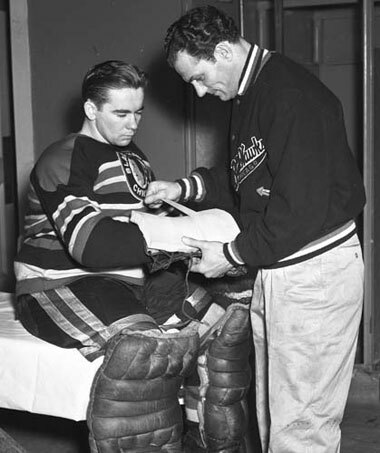 In 1952-53, Emile spent the entire season with the Western Hockey League's Vancouver Canucks, and not only won the league's award for top goaltender and was selected for the WHL's First All-Star Team, but was selected as recipient of the Leader Cup as the league's MVP. That summer, he was shipped with Neil Strain and cash to the Cleveland Barons of the AHL, with Johnny Bower and Eldred Kobussen moving to New York. In his first season in Cleveland, Emile led the Barons to the Calder Cup as AHL champions and was voted to the Second All-Star Team. Beginning in 1955-56 until his retirement in 1960, Emile toiled in the WHL. "I played 15 years and enjoyed every minute of it," he said. "I thought I was the luckiest guy in the world." But a career in hockey didn't conclude with the final time he took off the pads. 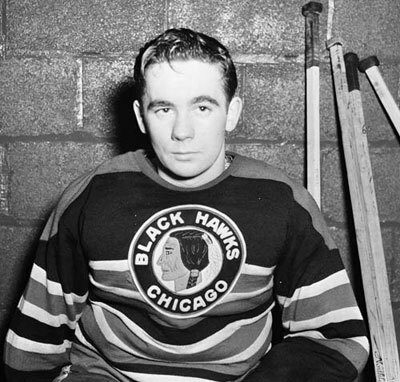 "The year before I retired, Tiny Thompson, who was living in Calgary, contacted me and said, 'When you're finished playing, you've got to come back to the Black Hawks. We want you to be part of our organization as a coach. The next year, I knew it was time to pack it in. Tiny Thompson asked me to go to Moose Jaw to be the manager and coach there. He said, 'We have five or six prospects in Saskatchewan and if you are in Moose Jaw, they'll play there.'" Excited by the idea, there was a hitch. "Even though I was retired, the Spokane Comets (of the WHL) owned my rights, and they refused to release until they got someone back." Emile was clearly a valuable commodity, too. Chicago tried to get Emile to coach in Moose Jaw, Detroit's Jack Adams wanted him to coach in Edmonton and Muzz Patrick asked him to join the Rangers' organization. Emile came close to joining Moose Jaw, but Chicago was dragging their feet on compensating Spokane. Something didn't feel right to Francis. "Finally, Muzz Patrick (of the Rangers) said, 'If I can make a deal with Spokane, will you come with us?' I said, 'Sure!' He asked where I'd like to go. Well, I had been in professional hockey for 15 years and always enjoyed working with young people. I said, 'I'd like to go to Guelph to coach a junior team in the Ontario Hockey Association.' An hour later, Muzz called back and said, 'We're all set.' It took Chicago more than a month and they couldn't make a deal with Spokane. The Rangers made a deal in an hour and I was in Guelph within the week. That's how I joined the Rangers' organization. I had a guardian angel on my shoulder." Led by future New York Rangers' superstars Rod Gilbert and Jean Ratelle, in 1960-61, Emile's first year with the Guelph Royals, the team formerly known as the Biltmores finished first in the OHA. The next season, without the two star forwards, the Royals slumped back in the standings, but Francis had impressed his bosses. The new owners of the Rangers summoned Francis to join the NHL team as assistant general manager. "I hated to leave Guelph because I loved it there and the Rangers had been there for a lot of years and had won Memorial Cups there in 1952 with Andy Bathgate and Harry Howell. But to play in the National Hockey League had always been my dream, and then after I was through playing, to come back to continue in the NHL continued the dream." Under manager Muzz Patrick and coach Phil Watson, the New York Rangers had faded terribly and was badly in need of an infusion of new talent. "I saw every player in every league. When they asked me to be the general manager, I knew every player, and what they were doing." Early additions included former Montreal star 'Boom Boom' Geoffrion and netminder Ed Giacomin. And riding the Goal-A-Game Line of Gilbert, Ratelle and Vic Hadfield, the Rangers returned to the playoffs in 1967-68 for just the second time in nine years. When expansion plans were being formulated, Sid Salomon, the owner of the St. Louis franchise, contacted Francis for advice and asked if he could recommend someone to run the new club. "I said, 'Lynn Patrick.' He was coaching L.A. in the Western League and I told him that Lynn was a good guy, a good general manager and a good coach. That's how Lynn Patrick was hired and then he brought in Scotty Bowman to coach." The popular Francis had made a frequent trading partner out of the expansion St. Louis Blues. "After sponsorship, there was a universal draft and we owned a surplus of players. I didn't want to lose players to an American League club for $15,000 or to a National Hockey League club for $20,000, so I would deal players off for draft choices. I found a partner I could get close to and that was St. Louis. I made so many deals with the Blues that they use to call them New York West." 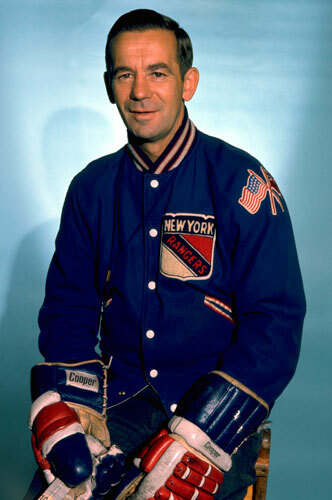 Although the Rangers went to the Stanley Cup final in 1972, the first time they had gone that far in the playoffs since 1950, Francis eventually fell out of favour in New York and was replaced by John Ferguson. "When I left New York, the Blues were anxious to have me come there. I got 10% of the club and that's how I ended up with the Blues," he recalled. Among the many tasks given to Emile was to find new owners for the Blues. "I eventually did and that's how Ralston-Purina came in. That saved the franchise. But they said they wanted 100% of the stock. I gave up my stock and Lynn Patrick gave up his stock. At a press conference, a newspaperman I knew said, 'Ralston-Purina just said they own 100% of the stock. Is that true?' I said, 'Yes they do.' He asked, 'What happened to your 10%?' I said, 'Well, they gave me a lifetime supply of dog and cat food, and my dog doesn't even like Ralston-Purina food!' We could laugh about it anyway!" After The Cat's St. Louis contract ended in 1984, the hapless Hartford Whalers asked permission to speak to Francis about joining their club as general manager. "Five different insurance companies owned the franchise and they were losing $4 million a year," stated Emile. "Hartford was the worst team in the league. They made a proposition that I would stay with them for at least five years. I said, 'Don't worry about me leaving, but building a franchise takes a hell of a lot of work. What I don't want to see happen is that I help you get out of the hole and then you leave.' They said, 'Oh no. We'll never leave.' The first year we cut the losses from $4 million to $2 million. The next year we cut the losses from $2 to $1 million. The third year we made $3 million and the fourth year, guess what they did? They sold the franchise for $50 million. Real nice!" During that time, Francis helped lead the team to previously unimagined heights. Using shrewd deals to bolster the line-up, Hartford reached playoff contention for the first time in six years in 1985-86, pushing the Montreal Canadiens to seven games in a thrilling Adams Division final. Emile Francis was named NHL Executive of the Year by both The Hockey News and The Sporting News. The next season, the Whalers finished first in their division. After the 1988-89 season, Francis was named president of the Whalers. In 1993, after a 47-year career in hockey, Emile Francis retired. "I built three teams – the New York Rangers, the St. Louis Blues and the Hartford Whalers. Lotta work," he laughed. But while hockey is no longer a full-time career for Emile, it will never leave his blood. "I still do a few things with the Rangers. I go back there four or five times a year. I was chairman of the general managers' committee for ten years along with all the other things I was doing. And I served on the Hockey Hall of Fame's Selection Committee for eighteen years." 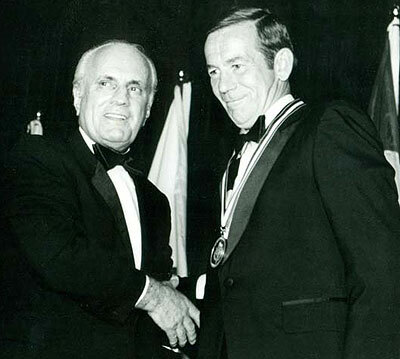 Long recognized as one of the outstanding minds in hockey, Emile Francis was awarded the Lester Patrick Trophy in 1982 for his contributions to hockey in the United States. That same year, he was inducted into the Hockey Hall of Fame in the Builder category. Asked if he had any final statement to make regarding his glorious career, Francis immediately added, "Hockey is the greatest game in the world!"